People who enjoy a more refined approach to drinking coffee prefer to use pour over coffee makers for their daily brewing needs. 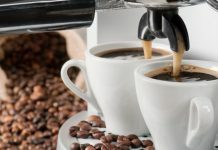 The reason behind this is because a pour over coffee maker should, at least in principle, create a somewhat more flavorful taste without altering the coffee’s properties. Such a coffee maker affects everything from the coffee’s consistency to its brewing temperature. It is for this reason that those who enjoy an exquisite cup of coffee opt for a pour over coffee maker or at least one they can operate differently from regular coffee makers. That said, we should point out that there are minor differences between pour over coffee makers, differences that may impact the overall quality of your brew. In this respect, some coffee makers are definitely better equipped than others. 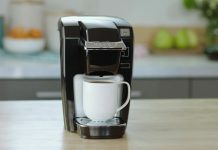 In fact, some coffee makers can also benefit from added features that others simply do not have, not to mention the increased standard of durability and reliability. With this in mind, let us find out what are the ten best pour over coffee makers and what particularities to look for when buying one. Since it was designed to conveniently fit almost any mug, this pour over coffee maker will make you enjoy the richness of a fresh coffee cup directly into your mug of choice. Made of a high-temperature resistant borosilicate glass and including a double-lined stainless steel filter, this is a no-frills coffee maker that allows you to customize each cup almost any way you wish. Not only that but you will find that this particular coffee maker works a lot better with high-end, refined coffee beans. For a lone coffee drinker, this ceramic coffee dripper by Bee House could be just the thing. It directly sits on your mug and allows you to put your filter and the coffee grounds in it a cup at a time. Its sturdy, classy ceramic build makes it quite durable, while the compact design makes it quite portable and thus ideal for on the go individuals. Offering a 1 to 2 cup capacity and available in 6 color options, you can leave it at the office or pop it in the car for added portability. Different people like their coffee differently and this decanter by Bolio is a great choice for fine-tuning your personal coffee since it offers you the freedom to choose between using a hemp filter, paper filter, or a stainless steel one. The steel filter directly fits on top of a separately sold double-walled carafe for user convenience. You can also go by the reusable filter basket if you choose to use the disposable filters, a much-needed addition for any enthusiastic coffee drinker. Made by Bodum, the BISTRO Coffee Maker offers the perfect way to get into pour-over coffee brewing especially since it is all automatic. As such, you rest content that the finer coffee-making points such as temperature control and brew consistency are all taken care of. The Bodum BISTRO brews up to 40 ounces of coffee, which renders it ideal for the 4-cups daily people or for a family of coffee drinkers. This single-serve coffee dripper by the popular OXO Good Grips is perfect for effortlessly preparing consistently flavorful pour-over cups of coffee. Its auto-drip tank controls the rate of water flow precisely for a well-balanced and consistent brew. The measurements calibrations on the tank indicate the exact amount of water you should add up to 12 ounces, which is a quite useful feature to have. At the same time, a well-integrated lid helps in heat retention as the coffee brews, and it can double as a drip tray when the coffee maker is lifted off your mug. The dripper is designed to securely rest on various mug sizes. The Apace Living Pour-Over Coffee maker has a sturdy glass carafe featuring a convenient handle, a coffee scoop, and a stainless steel permanent filter. It is a set that gives you all that you need to start off, and it is an ideal choice for beginners and coffee connoisseurs both. The permanent filter means you will save so much on disposable filters. Furthermore, this spacious coffee maker delivers a capacity of 2-3 cup brew, a capacity that should prove more than enough for multiple servings at a time. With the Bodum Pour-Over Coffee Maker, you have a versatile option to consider, one that offers a lot more than what most coffee makers have to offer. For just the coffee maker, there are 7 color choices, all including a permanent filter of stainless steel. Moreover, it comes in three different sizes, along with the complete set. As such, if you are a starter, you can have a full package of this 17-ounce coffee maker, 17-ounce electric kettle, electric coffee grinder, and a 15-ounce travel mug for good measure. Coming from Coffee Gator, this is a functional pour-over coffee maker featuring a premium glass carafe with a high quality, reusable stainless steel filter. Offering a 10-oz capacity, which serves 1 or 2 cups, it is ideal for giving you a particularly customized coffee brew. The tab integrated on the filter matches the collar and they are both great for protecting your hands against the high temperature of your just-brewed coffee. This 6-Cup Pour-over coffee brewer offers one of the most cost-efficient ways for your daily coffee needs. The package comes complete with both a carafe and dripper, thus offering a full set of coffee-brewing utensils. Moreover, different options are available at your disposal in regards to the coffee maker’s particularities and its design. This way you get to select from a coffee—the dripper only, dripper and carafe, or dripper and travel mug. These are enough options to ensure you get exactly what you need without overspending in any way. This is by far the highest-rated pour-over coffee maker available today and it is easy to see why. The 6-cup Classic Series, together with the innovatively designed, unique Chemex Bonded Filters, guarantees a pour-over coffee brewing for a perfect cup with no bitter elements or sediments. Its reliable functionality combines with an ideal visual elegance to provide a rich, full-bodied coffee extraction. We should also point out that its quality glass-made hourglass-shaped flask does not absorb chemical residues or odors, and that the Chemex filters are of premium-grade filter paper for the finest filtration possible. Last but not least, an included polished wood collar integrating a leather tie adds to the overall style of this quite exquisite coffee maker. The general principle behind pour over coffee isn’t all that complicated, as the whole process generally relies on patience. We say this because the pour over method involves freshly ground coffee that you insert into a coffee making appliance, followed by the pouring of hot water over the coffee. This enables you to fully control not only the speed of the brew but also the taste and strength for each serving. In this respect, you have to get yourself a coffee maker that isn’t just practical and reliable but one that will also withstand repeated use for long periods of time. That said, let us find out what makes a good pour over coffee maker and what characteristics to look for when buying one. For the most part, pour over coffee makers can be made out of glass, ceramic, plastic, and metal. Each of these coffee makers comes with its own particularities and limitations, which is why you want to first figure out what exactly you expect from a coffee maker and whether you can make the most of it on a regular basis. We should also point out that they each have considerable pros and cons, which explains why some people prefer some over the others to the point where they don’t even drink coffee that wasn’t prepared in the ‘right’ coffee maker. 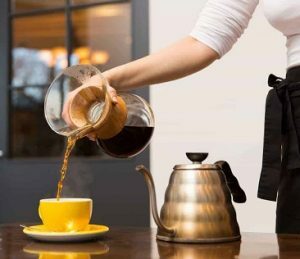 It may sound a bit snobbish but bear in mind that each type of coffee maker is designed to instill specific properties in every batch they brew. Glass Coffee Makers – The main benefit of a glass coffee maker is its capacity to remain chemically inert throughout its usage. This way, it will not impart any additional flavor onto the coffee other than the coffee’s own aroma and flavor. It also insulates quite well and keeps the blooming ground at the proper temperature during the brewing process. At the same time, a glass pour over coffee maker also allows you to see everything that happens inside the coffee maker at all times due to it being see-through. Ceramic Coffee Makers – With ceramic coffee makers, you get roughly the same benefits you get with glass, with the added notion that it isn’t exactly transparent. We should also point out that ceramic coffee makers tend to stan a lot easier than glass, mainly due to the fact that they are thicker and heavier. Other than that, it also has to be said that ceramic is also quite difficult to store, just like glass, mostly because of how prone these coffee makers are to physical damage. Plastic Coffee Makers – Perhaps the greatest benefit plastic coffee makers have when compared to ceramic and glass ones is the increased durability. In this respect, plastic coffee makers are much lighter in weight and a lot easier to carry. The only real issue with plastic pour over coffee makers is the problematic nature of plastic when it reaches certain temperatures. 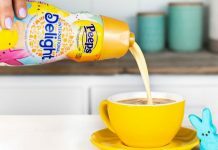 We say this because plastic tends to impart some of its ‘taste’ with the liquids it gets in contact with, a plastic taste that you will eventually be able to feel after using the coffee maker for too long. Metal Coffee Makers – No other type of coffee maker is as sturdy and durable as one made of steel. These appliances are easy to store and even easier to transport, albeit at the cost of being somewhat harder to maintain. Not only that but similar to plastic, metal coffee makers tend to impart a metallic taste to the coffee, on top of not being capable of insulating all that well. This might end up causing your brew to drop quickly in temperature, affecting its overall taste and flavor. When it comes to coffee makers of any kind, you absolutely have to consider the filters and the standard of filtering they offer. In principle, filters can either be made from paper or steel depending on the manufacturer and the type of coffee maker. Regardless of the coffee maker, however, it is very important that you employ the right filters, lest you want leftover coffee to make its way into your cup along with other impurities. Paper Filters – The greatest advantage of paper filters is their affordability. Not only are they cheaper overall but they also provide a seemingly better extraction without the issues that steel filters sometimes have. The only real downside to paper filters is the fact that they sometimes absorb coffee oils, the same coffee oils that give a good brew its exquisite flavor when prepared in a traditional fashion. Stainless Steel Filters – Although much more expensive than paper filters, you do get a lot more use from stainless steel than you get from paper. As long as the stainless steel filter is compatible with your particular coffee maker, it should pay for itself over time to some extent. Perhaps its greatest advantage is the fact that it extracts none of the much-needed flavor oils that good coffee contains. In fact, the only real downside to a stainless steel filter is the initial cost and the required maintenance that can get a bit tiresome over time. With pour over coffee makers, one should always ponder about their portability, mainly for practical purposes. Given how compact these coffee makers are when compared to traditional models, it would definitely be wise to invest in a coffee maker that you can take with you on the road when you travel. Not only that but you might also want to employ its services when you’re at work or in any other social setting where a coffee maker might come in handy. For the most part, pour over coffee makers are quite easy to use and even easier to set up, which is precisely why they enjoy such a huge popularity nowadays.